Sandestin Owners Association web re-design - South Florida Web Design Studio : South Florida Web Design Studio! 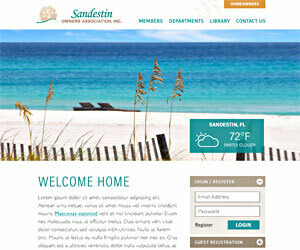 SoFla Web Studio creates a newly designed interactive membership website for the Sandestin Owners Association. Custom designed and developed with WordPress. The Sandestin Owners Association is a large membership based homeowner association located in Sandestin, FL. Over 5000 residences are included in the association and HOA website was needed to accommodate specific functionality requirements outlined by the association staff. WordPress was chosen as the Content Management System (CMS) specifically for the membership components. The existing website was built with Drupal and the conversion to WordPress has simplified the workflow and management for the entire team at the Sandestin Owners Association.